Dental implants are a great way to replace missing teeth. Implants are essentially an artificial tooth root onto which an artificial tooth is placed. The end result looks and feels like a natural tooth. Implants are very durable and will last for many years if good oral hygiene is maintained. Implants are an excellent alternative to dentures and can be used to replace a single tooth – or even a full set of teeth. A dental implant is usually made from titanium, which is placed into the jaw. A crown or bridge is then fitted on top to replace the missing tooth. Several implants can strongly secure a denture in place and give you the confidence to eat what you want without worrying about them coming loose. The procedure of having dental implants is performed over a period of several months. Initially the implant is placed into the jawbone and left to heal over a period of three to six months. Once the jaw has healed, an impression is then taken of the mouth and sent to a dental technician. The technician then builds a bespoke replacement tooth that will blend in naturally with the patient’s other teeth. 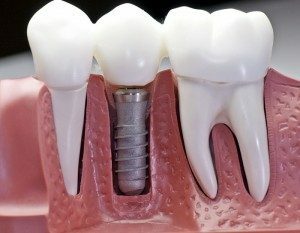 Once the replacement tooth is ready, it will be tried in place and small adjustments made to ensure you can bite comfortably. Once you and your dentist are happy, the replacement tooth is then secured in place. Good oral hygiene is vital after implants have been fitted. As well as avoiding decay and gum disease, this will prolong the success and life of the implant. Our dental implants start from only £995 or from £83 per month with our interest free finance. Call us on 0151 722 6500 to make a no obligation consultation today. You can also watch our videos on this page to learn more about dental implants at Chelwood Dental.